Tedd Benson. Photo courtesy: Bensonwood. Author and building pioneer Tedd Benson has devoted his life to developing a better way to build. Founder and CEO of Bensonwood & Unity Homes in New Hampshire, his endeavor has been to revive traditional timber framing and carry it into the 21st century. Since his youth, Tedd has been a crucial figure in the revival of timber framing in America. He was one of the founders of the Timber Framers Guild of North America in 1984, and authored four books on the subject. Through the decades, his first company, Bensonwood, established itself as a creative leader in timber frame design, engineering, craftsmanship, and computer-aided technology. Their work can be found almost anywhere in the US, and in several other countries. From the start they have devised ever more efficient production techniques, and ways to improve the energy performance of the homes themselves – such as pioneering a method of wrapping the timber structure with a high-density insulation system that greatly reduced energy loads. Solar on a Customized Unity Xyla. Photo Courtesy: Unity Homes. In progress photo of solar installed for one of Unity Homes’s clients. Bensonwood and Unity Homes are indeed in it for the long haul. Their pursuit of merging old world craftsmanship with new world technology has manifested in the construction of their 110,000-square-foot building component manufacturing facility in Keene, New Hampshire. The facility has a solar array, with plans for expansion, that produces nearly 50% of its electricity. Centralized production is a major step in the streamlining that is essential to making increasingly affordable homes. Custom timber framed racking system for Tedd Benson’s home PV system. This long-haul view means that solar is almost a no-brainer on Bensonwood and Unity Homes. 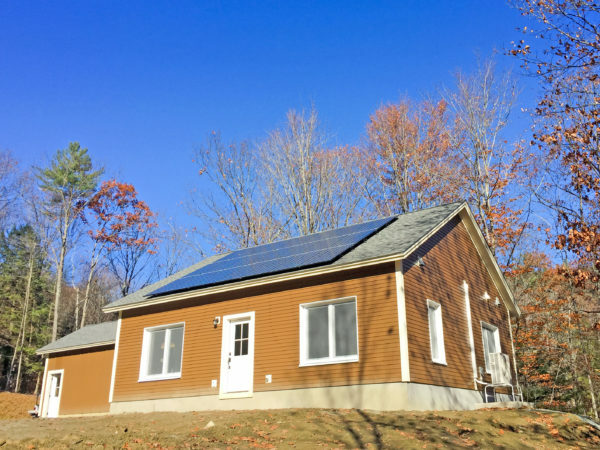 Solar, and complementary technologies like heat pumps, enables their high-efficiency timber frame homes to generate most of their own energy. In addition to go-to rooftop solar, Bensonwood and ReVision are planning some interesting collaborations such as developing timber frame kits for ground-mounted solar arrays and solar car charging canopies. Most recently, ReVision worked with Tedd to pull an older PV array from his barn roof, and move the panels onto a custom-timber framed ground mount racking system, then put new PV on the roof and re-wire the ground mount!